Like the title says, Summer it is the story of disco queen and music star Donna Summer. Three actresses play Summer at various times in her life: LaChanze (The Color Purple, Once on This Island) as “Diva Donna,” Ariana DeBose (A Bronx Tale, Hamilton) as “Disco Donna” and Storm Lever (Freaky Friday) as “Duckling Donna.” All three are excellent. The book by Colman Domingo, Robert Cary and Des McAnuff provides highlights from the diva's life without clogging the flow with too much information. Satisfyingly, a portrait of a strong women, who has survived sexual and substance abuse and who is a strong role model emerges (no small feat for three male writers to achieve). There were things I didn't know at all about this singer and I came away with a lot of respect for her. I had always liked her music, which included pop hits like "Love to Love You Baby," MacArthur Park," "On the Radio," "Hot Stuff" and "Last Dance," all of which find themselves performed in the show along with many others, but really hadn't known much about her private life. The production is very well done. 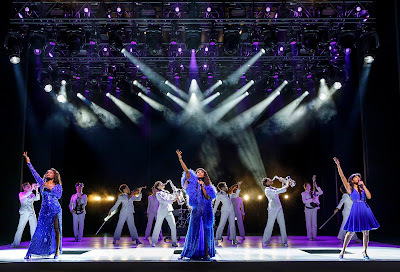 Director Des McAnuff does a good job of blending the different Donnas and gets excellent performances, both vocally and emotionally from all three.The story is engrossing and the music, under the direction of Victoria Theodore, makes you want to get up and dance. Those on stage get to do some great choreography by Sergio Trujillo. Summer works hard for the money at the Lunt-Fontanne Theatre, 206 West 46th St., NYC. thedonnasummermusical.com. Ensemble: Angelica Beliard Mackenzie Bell ), Kaleigh Cronin, Kimberly Dodson, Anissa Felix , Drew Wildman Foster, Kendal Hartse, Afra Hines, Jenny Laroche, Wonu Ogunfowora, Rebecca Riker, Christina Acosta Robinson, Jessica Rush. Harris M. Turner,Aurelia Michael, Jody Reynard. Music supervised by Ron Melrose; sccenic design by Robert Brill, costumes by Paul Tazewell, lighting by Howell Binkley, sound by Gareth Owen, projections by Sean Nieuwenhuis. -- Some more mature content. I would give it a PG-13 rating.